I would disagree with the artists' saying, if only because it is difficult to determine when an artwork is completed. In fact, I strongly doubt that any artwork is ever truly complete; at a certain point in time, the artist stops working on a piece and turns it over to the viewer, and a conversation begins among the three parties. What do I see when I look at your piece here? I see your artwork as a starting remark in our conversation, but a profound remark indeed. You have in fact opened a field of infinite possibility within this work, a field in which I could wander for a long time. Some people would see crumbs on a table-top when they look at this piece; I see epic journeys, portraits of passionate individuals, struggles, ecstasy. Your picture has become the third party in our conversation, and what a story it has to tell! Leonardo Da Vinci once advised young artists who felt lacking in inspiration to look for it in the veins of marble, in the staining on walls. 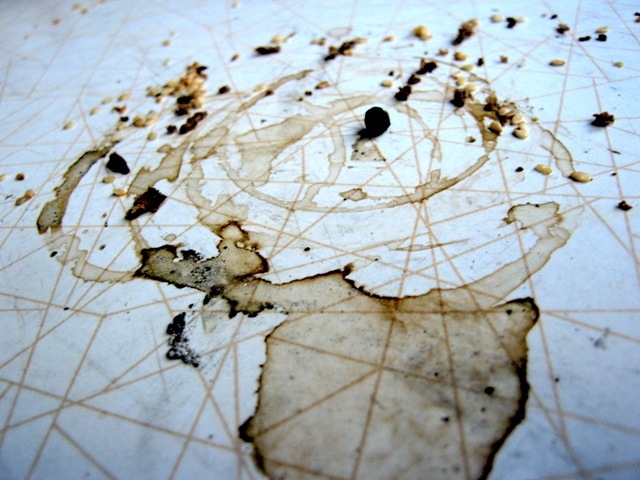 But your picture shows that one can find inspiration even in the crumbs on one's own table. Thank you for this piece, which opens up this vast new field of visual exploration. The crumbs may soon disappear Tomas, but the memory of this great painting will remain etched in my mind for some time. Lovely work my friend. Great work Tomas. The art is different for all that view it. A true artist like yourself has the ability to open the minds of the view. I am very much a first glance what do I see type of person. Today I am depressed so I see the Burmuda Triangle and devastation. Tomorrow I will see something different. That is what makes true art. In my opinion of course. visiting you here.. nice photos you got here.. i hope you can visit my blogs too!